It looks like the beginning of the end for Chile’s system of private pensions based on forced retirement savings. The Chilean model has been promoted by the World Bank in an effort to move contributory pensions away from public, pay-as-you-go schemes to privately-managed, pre-funded schemes. Developing countries around the world have implemented versions of the Chilean model, but there are increasing complaints of high administrative charges and poor returns for participants. The model seems to have lost its appeal even in the World Bank, which now places more emphasis on non-contributory pensions, referred to as a ‘zero pillar’. Hundreds of thousands of people across Chile have taken part in protests against the country’s controversial privatised pension plan. The scheme was launched in 1981, during the military government of General Augusto Pinochet. …. President Bachelet, who is left wing, … proposed an increase in employer’s contributions and a reduction in commissions paid to the fund managers. But protesters want the Pension Fund Administrators (or AFP) scheme to be scrapped altogether. Leaders of the No More AFP movement have called a nationwide strike on 4 November. “Chileans protest against Pinochet-era private pension scheme“, BBC News, 22 August 2016. Peru is one of the many countries that would like to reform the Chilean model of pensions that they implemented long ago. By coincidence, I received today in my inbox a Declaration of The International Federation of Pension Fund Administrators (FIAP), offering technical assistance to the Government of Peru in improving its system. FIAP is based in Santiago, Chile. Its members are companies that administer the forced retirement savings deposited with them. Members are from numerous countries of Latin America, in addition to Spain, Kazakhstan and Ukraine. The Declaration is brief and very self-serving. For convenience, I am copying and pasting the substantive parts below, with a link to the full document. Note the absence of any mention administrative fees, and the desire to retain all savings under control of fund managers both before and after retirement. [FIAP] is aware that the individually funded pension system in Peru has room for improvement, but the improvements must be made on the basis of a broad technical discussion, with experts discussing the best proposals for the comprehensive reform of the pension system, which in this case would include the Pension Fund Managers (AFPs) …. The reforms that are implemented must ensure that t he pension system has ample coverage, grants sufficient pensions, is equitable and financially sustainable, avoiding reckless actions with populist goals and the approval of policies that are detrimental to the workers themselves (for example, the recently approved rule that allows the withdrawal of 95.5% of the funds at retirement age). …. The purpose of social security systems is to compel workers to renounce present consumption, so that when they are no longer able to work, they will have sufficient resources for financing their retirement. It is contradictory that after being forced to save throughout their working lives, workers are allowed to withdraw all their resources, leaving them devoid of all their old-age savings. FIAP therefore offers to put its technical expertise at the disposal of the competent agencies in the upcoming debate of the Commission for the Reform of the Peruvian Pension System, which will be created by the Government of the new President, Mr. Pedro Pablo Kuczynski, to fulfill the need to grant a worthy pension to all Peruvian workers. FIAP is an international agency comprising the Associations of Pension Fund Managers of the European and Latin American countries that have incorporated individually funded savings regimes into their pension systems. FIAP Declaration No. 4, 22 August 2016. Chile’s privatised pension system is missing more than US$2.2 billion of mandated contributions, according to the first annual report on unpaid pension contributions issued by the Chilean pension regulator Superintendencia de Pensions (SP). This is money that employers deducted from wages of workers, but failed to pass on to private pension funds. Of the 9.27mn clients in the system at end-December, approximately 1.83mn, or 20% of the total, had at least one contribution unpaid by their employer. Some 224,046 employers are tied to late payments, with average debt per employer amounting to around $4.79mn pesos [9,000 US dollars], said SP. …. At end-2012, there were 799,997 court proceedings underway to recover 841bn pesos, or 78% of the unpaid contributions. Of those, 32% are proceeding normally and 38% find the employer to be unreachable, while in 8% of these cases the employer has gone through or is going through bankruptcy proceedings. The remaining 22% are at the prejudicial debt collection stage. Of current unpaid contributions, 2.8% have been outstanding for more than 20 years, while 57.8% have been outstanding for between 10 and 20 years. Kieran Lonergan, “Chile’s outstanding AFP contributions exceed US$2.2bn“, BNamericas, 7 January 2014. Chile’s system of mandated contributions (10% of salaries) to individual retirement accounts is generating considerable employment for lawyers. Thanks to Michael Littlewood for the pointer. This chart is interesting. Bolivia stands out as the only country of the ten that has a universal pension in place. The black bars refer to the percentage of the labor force that contributes to a social security scheme. Many contributors will never receive a pension because they move in and out of formal employment, so do not contribute long enough to qualify for a pension. The red bars refer to the percentage of the retirement-age population that receives any sort of pension (contributory or noncontributory). The authors of the article observe “Recently, the Mexican president introduced a pension reform bill to Congress that would set up a universal noncontributory old-age benefit.” – without cautioning that the proposed pension, despite its name, is not universal. 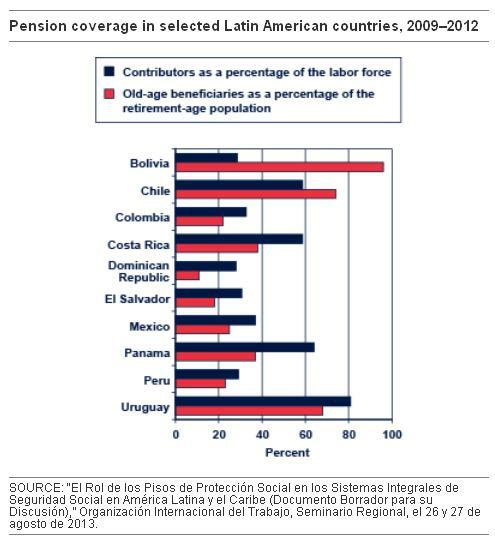 Source: US Social Security Administration, “Social Pensions and Subsidized Benefits in Latin America“, International Update (September 2013). US Social Security Administration, “Social Pensions and Subsidized Benefits in Latin America“, International Update, September 2013. This short article makes the important point that the move to pre-funded, private accounts did nothing to expand pension coverage in Latin America, but I question the assertion that Chile has reached its goal of providing minimum pensions to the poorest 60 percent of the population. It is true that a goal of Chile’s 2008 reform is to provide a minimum pension to each elderly member of households in the bottom 60% of the income distribution, but I have seen no evidence that this goal has been reached. 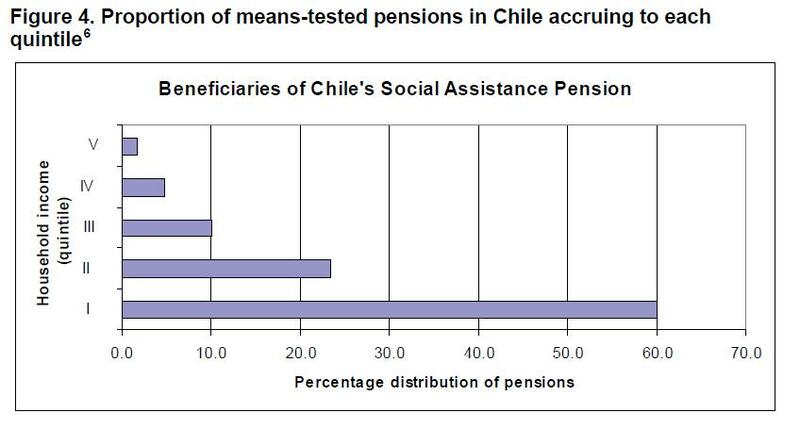 Chile’s previous “social assistance pension” targeted the poorest 15% of households, but more than 40% of social pensions were captured by those living in higher-income households, leaving vast numbers of elderly poor without benefits. There is no reason to expect targeting of the poorest 60% of households to be more accurate. HelpAge International has posted four more video clips from the testimony of myself and Michael Littlewood last November to a committee of the Legislative Council in Hong Kong. This brings the total number of clips to six. We are very fortunate that the Hong Kong government installed a superb recording system in its new legislative building. You will see that there are few participants in the meeting room itself, but a large number of spectators were watching and listening from above, behind a large glass window. Michael Littlewood (co-director of the Retirement Policy and Research Centre at the University of Auckland, New Zealand) explains New Zealand’s universal pension scheme, and discusses the role of government in retirement income systems. 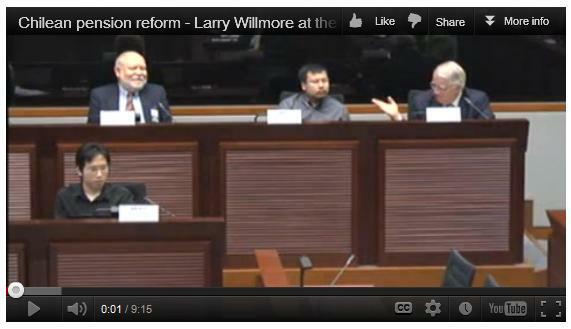 Larry Willmore and Michael Littlewood answer questions on means-testing in testimony at the Legislative Council of Hong Kong. Larry Willmore talks about stigma and means-testing as tax. Michael Littlewood explains why he’s changed his mind on means-testing and now believes universality is the best approach. Michael Littlewood, at the Legislative Council of Hong Kong, talks briefly about the pension system in Chile before sharing an experience from a recent trip to Bolivia. Drawing particularly on the experience of Mexico City Larry Willmore talks about how universal pensions can be designed and adjusted to be affordable. Michael Littlewood talks of the importance of community consensus as well as political consensus. Larry Willmore, speaking at the Legislative Council of Hong Kong, explains why contributory pensions are not able to alleviate poverty. Larry also discusses the different types of non-contributory pensions. Larry Willmore discusses why Chile’s 1981 pension reform, which attempted to expand coverage by tightening the link between contributions and benefits, was unsuccessful. HelpAge has posted a video of my 10-minute presentation on Chile’s pension reforms. This talk was ad-lib, in response to a question from the audience at Hong Kong’s Legislative Council last November, and does contain one error. The rural pension scheme I mention is for all of Mexico, not just Mexico City. Mexico City (the Federal District) is quite large, and contains districts classified as rural. Those elderly who live in the rural districts of Mexico City are thus entitled to two universal pensions: one from the federal government and another (more generous) pension from the local government. NB: This clip is fast-streaming. HelpAge will also (I think) be posting my introductory remarks. When that happens, I will replace my previous link with theirs. I will inform TdJ readers of all clips that HelpAge posts from the 2-hour LegCo meeting. It was a lively meeting, and many short segments are of general interest. HelpAge, “Chilean pension reform – Larry Willmore at the Legislative Council of Hong Kong“, Pension Watch, 5 September 2012. Pinochet’s Chile: model for US pension reform? Herman Cain, the former pizza executive surging in polls for the Republican presidential nomination, wants to replace Social Security with what he called the “Chilean model” of private pension funds. …. Chile’s system, introduced under the 1973-1990 dictatorship of Augusto Pinochet, diverted workers’ contributions into privately run funds, slashing government revenue over the next few decades in exchange for a reduction in state pension payments 30 years down the line. The military regime prepared for the new system in 1981 by cutting spending, building up a fiscal surplus and clamping down on all forms of dissent. …. “For the U.S. right now it would be impossible,” said Alejandro Micco, who was the chief economist at Chile’s Finance Ministry until last year. To change to a private pension system “you either need to have a very big fiscal surplus to pay retirees without income from workers, or go into debt.” …. José Piñera, brother of Chile’s current President Sebastián Piñera, designed the pension system when he was Pinochet’s labor minister. He now travels around the world touting its benefits …. He declined to be interviewed for this article, citing engagements in Europe. Twenty-seven years after starting the system, … Chile’s government felt the need to reform it. In 2008, they started a minimum pension for people who had made contributions for 20 years and raised payments for people who had no pension provisions. Sebastian Boyd, “Cain’s Social Security Model Risks Miring U.S. in Deeper Debt“, Bloomberg Businessweek, 17 October 2011. The information in the final paragraph above is incomplete and misleading. Pinochet’s government provided – from 1975 – a small assistance pension targeted, supposedly, to the poorest 15% of the elderly population. In practice, much of this assistance went to those who were not poor, and many of the poor died waiting for a pension. The 1981 reform of José Piñera added a minimum pension for those with a contribution record of at least 240 months. This minimum pension was paid by taxpayers, was very costly, and went predominately to contributors (mostly housewives) in the upper half of the household income distribution. The 2008 reform replaces the poorly-targeted assistance pension and the regressive minimum pension with a single, flat “Solidarity Pension” for those in the lowest 60% of the income distribution. The Solidarity Pension functions almost as a universal minimum pension because it is recovered from other pension income. Thanks to Andrew Biggs for the pointer. Posted in Pensions | Comments Off on Pinochet’s Chile: model for US pension reform? Notes for a keynote address that I will deliver on November 27th to the Symposium “International Experiences on Universal Pensions” at the Polytechnic University of Hong Kong. The event is sponsored by Alliance for Universal Pensions (Hong Kong), an umbrella political action group. Universal pensions and universal minimum pensions are similar, with one important difference. A Universal Pension is a flat amount paid from general government revenue to all who qualify by residence or citizenship once they reach a designated age. Benefits are given regardless of a person’s employment history, income, assets, or retirement status. A Universal Minimum Pension is different only because it is tested against other pension income. It provides fewer benefits – or none at all – to those with sufficiently large employment-related pensions. This pension test is equivalent to a tax on pension income. The three cases that I discuss illustrate distinct paths to – and from – universal systems. Mexico City is a wonderful example of successful and speedy implementation of a universal pension. Chile’s tortured history, with reforms in 1975, 1981 and 2008, has left the country with a unique hybrid of minimum pensions and social assistance pensions. Norway, which had a universal pension in the past, now provides only minimum pensions to the elderly who meet residence requirements and are not gainfully employed. Mexico City’s modest, universal pension has functioned effectively and efficiently for ten years, without a hint of corruption. In 1981, Chile introduced a major reform. Its most-publicised component was a switch of the contributory system from collective, pay-as-you-go pensions, to individual, pre-funded accounts. Another, less-known component of the 1981 reform was the introduction of a minimum pension. It was twice as large as the assistance pension, with no limit on the number of beneficiaries, who were drawn almost exclusively from the wealthiest half of Chilean households. There has been much disappointment in Chile with the 1981 reform. A 2008 change replaced the poorly-targeted assistance pension and the regressive minimum pension with a single “Solidarity Pension”, recovered from other pension income. The rate of recovery was initially set at 100%, but is now 50% and will fall to 37.5% next year (2012). Chile’s “Solidarity Pension” is a minimum pension, but it is not universal because households in the upper 40% of the income distribution are not eligible for benefits. It remains to be seen whether targeting will be more accurate for this pension than it was for the assistance pension that it replaces. In time, the system might evolve into a true “minimum universal pension” or even into a universal pension. Norway had a universal pension from 1959, but only for ten years. In 1969, the government re-introduced income-tests and became an all-too-common example of governments forcing citizens to save in order to replace a universal, flat pension with individual pensions. Norway now guarantees each qualified person a generous minimum pension that effectively amounts to 45% of the average net wage. This is tested against other pension income and recovered at the rate of 80%. Incentives matter. My three case studies illustrate how a government’s intervention in retirement incomes, particularly with regard to income tests, can change behaviour but often in unintended ways. They also suggest that the more detailed the intervention, the greater is the likelihood of even greater future interventions. Correction: With the 2011 reform, retirement from work is no longer required for receipt of a pension in Norway. PensionReforms senses the reform did not go far enough, but reaches a more positive assessment – more on that below. Poverty in Chile has to date been expressed by reference to household income. `Household’ is defined as one or more persons, not necessarily related, who live together in the same dwelling and share a common food budget. The 2006 household survey revealed that 13.7% of all households had per capita incomes below the poverty line, but only 7.5% of households with an elderly member (aged 60+) had less than poverty-level per capita incomes. An elderly person who lives in a non-poor household – with a friend or with the family of an adult child, for example – is not classified as poor, even if she has no income of her own. …. Everyone 65 years and older, regardless of their contribution history, is entitled to a minimum pension of 60,000 pesos (US$118) a month beginning July 2008, increasing to 75,000 pesos in July 2009 and subsequently indexed to consumer prices. The report surprisingly concludes that the new Solidarity Pension is too generous, since “the non-elderly … must work all day to attain a level of consumption similar to the retired elderly”. This assertion is justified by looking at “the autonomous income (market wage) of a couple in the 40th percentile of the income distribution” in the household survey, then making the dubious assumption that this is equivalent to wages earned by both husband and wife working at full-time jobs for the entire year. A pension of 60,000 pesos is about 13% of per capita GDP – 37% of the minimum wage – which does not seem excessive to PensionReforms. …. The [Valdés] report fails to mention that the means test is now based only on the per capita income of husband, wife and dependent children [rather than the household]. It notes only that “the new law defines household on the basis of blood ties, while the CASEN [household] survey defines household on the basis of sharing cooking and shelter”, and points out that since the new definition “is incompatible with the definition used by the survey which is the source of the data used to rank households by average income per capita”. PensionReforms discovered that the government is aware of this, and intends to amend the annual household survey to include questions on family groups. For elderly persons without pension income and who want to live with their adult children without becoming a burden, this reform will be seen by them as a godsend. …. PensionReforms thinks that the 2008 reform was both useful and necessary but suggests that it should be seen as just a step in the right direction. Chile since 1975 has recognised that compulsory Tier 2 schemes cannot meet a government’s social objectives for financial support to its older citizens. Now it is time to move to a universal Tier 1 pension. The 2008 reform has made that easier. “The 2008 Chilean Reform to First-Pillar Pensions“, Pension Reforms, 26 February 2009. Recycled from the TdJ archive, 12 March 2009. There is a link to Valdés-Prieto’s report at the end of the Pension Reforms abstract. child, for example – is not classified as poor, even if she has no income of her own. …. 37% of the minimum wage – which does not seem excessive to PensionReforms. …. burden, this reform will be seen by them as a godsend. …. support to its older citizens. Now it is time to move to a universal Tier 1 pension. The 2008 reform has made that easier. “The 2008 Chilean Reform to First-Pillar Pensions”, Pension Reforms, 26 February 2009. Recycled from TdJ archive. There is a link to the full report in the Pension Reforms abstract. Wealthy businessman Sebastián Piñera narrowly defeated Eduardo Frei, candidate of the centre-left Concertación coalition, in last Sunday’s run-off election. A Financial Times editorialist acknowledges “Chile’s democracy has solidified”, but warns that the conservative Mr Piñera may not be the best choice for Chile’s economy. Concertación can be proud of its economic record. Chile has enjoyed solid economic growth in all but two years since Pinochet’s ouster. …. These will be hard acts for Mr Piñera to follow. … [H]e promises to create 1m jobs and to raise the growth rate to 6 per cent from 4 per cent over the last decade [but this] higher growth rate must not come at the expense of the poor. …. Mr Piñera’s private interests … remain a source of concern. Unless he relinquishes control of his corporate empire and avoids giving business connections political influence, he may paradoxically be worse for Chile’s economy than the country’s pragmatic left. “A change for Chile”, Financial Times, 19 January 2010.